Ben, meanwhile was confused. He’d arrived somewhere, but the place no sense! There was little or no gravity, there was an immense strip of intense blue light – call it “overhead” – that seemed to run into infinity, and there was some evidence that a powerful wind was carrying him along through an infinite blue sky! All he could see was a deeper blue away from the strip, with maybe a hint of red, and blueness which seemed to go on forever in all directions. This couldn’t possibly be a planet – there’d be SOME evidence of a surface, or cloud-layers, SOMEWHERE – and there were no landmarks save for the occasional… floating patch of vegetation. Wait, were those holding against a wind or somehow traveling upwind? What could be holding or driving them? It wasn’t long before he smacked into one. At least it was something solid to sit on, even if it did mean putting up with a constant gale. A good thing he had his pocket kits, since everything else had gone with the armor. The tree-leaves and structure seemed to be biochemically simple and primitive (if extremely tough) – and he could eat the leaves and seed-structures – but the whole thing contained conductive filaments, on which there were… massive circulating currents, which powered much of the things bioprocesses. Photosynthesis was only a sideline, perhaps only really required while the things were small and not yet large ready to operate on electrical power. But where was the power coming from? Why was there so much hard radiation about? Ah. A massive magnetic field. Enough to produce hysteresis currents in a long conductor, slowing it and counter-rotating it against a wind which seemed to vary somewhat with “altitude”. That still didn’t make any sense – where was the wind COMING from? Why would it vary with the “altitude”? Why no gravity? There was no sign that they were freefalling TO anywhere. An immense space habitat rotating around a star? Why full of nothing but air, occasional moister patches, and dust? Still, with a bit of improvisation with conductive wood and electrical power tapped off from the tree, he could improvise a spark-gap transmitter and a similar receiver. Good gods, he’d been reduced to building his equipment out of wood, bark, leaves and parings from his own fingernails. Could this get much worse? Stone and hides would be a step UP. That eventually got a response though – some birdlike people who lived in the trees. Unfortunately, they weren’t much help. They’d never even heard of solid ground. They used tree-radios like his own to communicate. To them, the world was an infinite tunnel of wind… If you flew too far towards the light, it got too hot. If you flew too in any other direction, the air got too thin and hard to breathe. The world had been the same for many generations. A telescope – assembled out of water and some bits he pulled in via the Codex – showed him much the same thing, although it did reveal a lot of turbulence in the blue light strip and lots of ultraviolet. There might be a few hints of other blue lights in the rest of the sky – but as far as you could peer out into it when there were clouds between you and the blue light, there was nothing much but a dim red glow. No stars… Shielding his pocket instruments showed that most of the radiation was coming from the strip of blue light. Ben looked at the blue light overhead… and abruptly his perceptions shifted. He HAD seen that sort of thing before. Several times… NO. That COULDN’T be POSSIBLE. There was no other explanation that didn’t call for rewriting physics or crazed superadvanced aliens (and he’d always hated non-explanations like that!). He was in an accretion disk around a rapidly-spinning galactic-scale black hole, floating above the tightly-compressed fusion plasma near the event horizon. The atmosphere was held together by tidal effects. Due to the oblate shape of the black hole, moving away from the equator was moving “uphill”. It was kept from dissipating into interstellar space “above” by the black holes immense gravity well, and it was fed and “supported” from the bottom by radiation pressure and by the waste products of high-order fusion reactions near the event horizon. But… that would require an immense, ongoing, flow of hydrogen and helium into the black hole! An interstellar medium of unprecedented density! A dim red glow, without stars save – perhaps – for their first sparks and the accretion disks of other black holes. Not the end of time, but the beginning. His telescope was looking at the afterglow of the Big Bang, still visible to the eye. 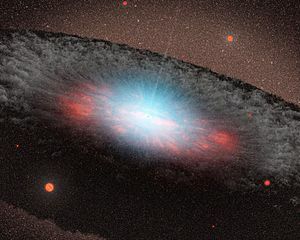 Less than two hundred thousand years since the first light of creation… The gases of the ring-environment were cooled by expansion into areas around the edge swept clean of hotter gas and dust by the gravity of the black hole. The presence of even a little life… would effectively accelerate the time in the environmental ring, allowing further cooling, reducing the turbulence of the fusion plasma to slow fluctuations and its radiation to more reasonable frequencies, and allowing still more life and still more time. The trees might even be native, although it was almost certain that the bird-people were not. They must have arrived from an older universe – and had, with desperate courage, colonized the one location in the early universe where their descendants might survive for a time. The ring-environment would eventually destabilize of course. The flow of hydrogen into the black hole would slow. The perilous dynamics of the extended accretion disk would tip beyond the point of stability – and the lower segments of the ring would fall into the fusion furnace. The rest would be blasted outward, into the forming galaxy around the great black hole – and would seed the galaxy with the genetic legacy of the first living things. Simple. Tough. Adaptable. It might take billions of years more before galaxies would bloom, but the legacy of the first life would continue, a heritage older than the stars themselves. The bird-folk however… They were sapient, and fragile, and too complex a form of life to withstand such stresses. Barring outside intervention – in itself, calling for a miracle, given that they were likely the only advanced life forms in the universe – they were doomed. Without the resources to build a technology, and with nowhere else to go, the final collapse would be a funeral pyre for their race. Their legacy would be lost. Well, when you lept across the dimensions unguided, didn’t you trust to the force to choose your destination? He always did seem to be arriving somewhere where things needed fixing….